The world of literature lost a legend when Ray Bradbury passed away. His visions of futuristic worlds set to a backdrop of present-day social commentary has inspired and enthralled readers for decades in classics such as The Illustrated Man, Something Wicked This Way Comes, and Fahrenheit 451. But along with the accolades there were the controversies. Fahrenheit 451, a book about a dystopian future in which books and reading are outlawed, has ironically been a banned book here in the real world. In fact, that title was the first one covered by the Banned Books Awareness project. 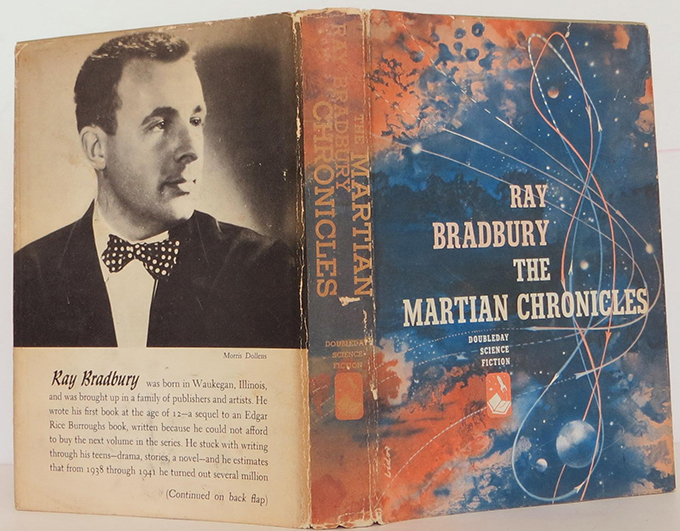 In honor of Bradbury’s passing, this week’s column will focus on another of his novels that has been challenged for some of its cultural themes- The Martian Chronicles. Originally published as a series of short stories in science fiction magazines of the late 1940’s, The Martian Chronicles was released in 1950 and told the story of the colonization of Mars by humans fleeing from an atomically-devastated Earth, and the ensuing conflict between the aboriginal Martians and the new human colonists. The novel’s themes satirized capitalism, racism, and the escalating cold war between the United States and the Soviet Union, which kindled opposition from parental and political groups. The irony is that the traps would be easy to recognize by someone who had read Poe, but the society’s members can’t see the danger because Poe’s works had been banned and burned back on Earth. Since none of the members have any familiarity with the stories and the clues they give, they fall victim. Step over the fine line between fantasy and reality and there are some real world incidents where Bradbury’s classic novel has drawn fire for its themes. There have been charges that the stories are sexist because the future illustrated shows a society where women are still second class to men. Men were the sole business owners, the shop workers, the entrepreneurs. For example, all of the crews that travel to Mars are male only. Even by the time the fourth expedition arrives, women are only mentioned in discussion of the men’s accomplishments and journeys. These crews are described as the “first” men, while the narrator explains that “everyone knew who the first women would be,” which to some suggests that the first women would naturally be the wives and children of the men who “conquered” Mars. Others have criticized its racial themes. In the chapter “Way in the Middle of the Air” we are experiencing Earth in June of 2003, where a group of white men are sitting on the porch of a hardware store. News has come that the black citizens in the American South have collectively decided to emigrate to Mars in their own custom-built rockets. The group of white men is shocked; and as the crowd walks by on their way to the rocket one of the men on the porch, Mr. Teece, tries to stop one of them, Belter, who owes him $50, but the crowd pays off the debt. The most recent case of conflict involving this novel came when profanity and the “use of God’s name in vain” generated a challenge and removal of this novel at Florida’s Haines City High School in 1982. What the critics fail to take into account when they cry out about sexist or racist themes is that Bradbury’s future which he illustrates was a mirror image of the reality of the time in which the stories were written, and a perfectly-crafted satire of that world. Satire is, by its very definition and intent, an over-the-top parody of the subject in focus. It seems this point is clearly missed by those who argue that Bradbury is promoting such things. Ray Bradbury was a prophet of science fiction and had a creative spark that will continue to inspire well into the future with these timeless classics of literature. Today, near the north pole of Mars, a piece of Ray Bradbury lives on, waiting to be discovered by someone. A digital copy of “The Martian Chronicles,” along with works by other science fiction legends, was flown into space in 2007 by NASA’s Phoenix spacecraft, which touched down on the Martian arctic plains.